Who on planet earth doesn’t look forward to a good vacation ? Given our stressful lives (and even if not really stressful), whether adults or kids, everyone looks forward to a change of scene, some new experiences, a special time with family and friends and just a little time to unwind and enjoy what the world or at least our country has to offer. But most of us have several limitations and restraining factors when we consider going for a vacation, whether it’s the duration of holiday, the time that one can travel, finance, decisions about the kind of place to travel to etc. So, when its time for a vacation, it’s important to make the right decisions and get the most out of our holiday destinations. In this article, we list out a few destinations in India which are fun places to vacation with the family. So, with summer holidays approaching, plan out your vacations suitably. One is indeed fortunate if they manage to visit this little paradise on earth. Kashmir, with all its natural beauty and splendour, despite all the difficulties they face on the political and religious front, is a place which families must experience together and collect memories for a lifetime. 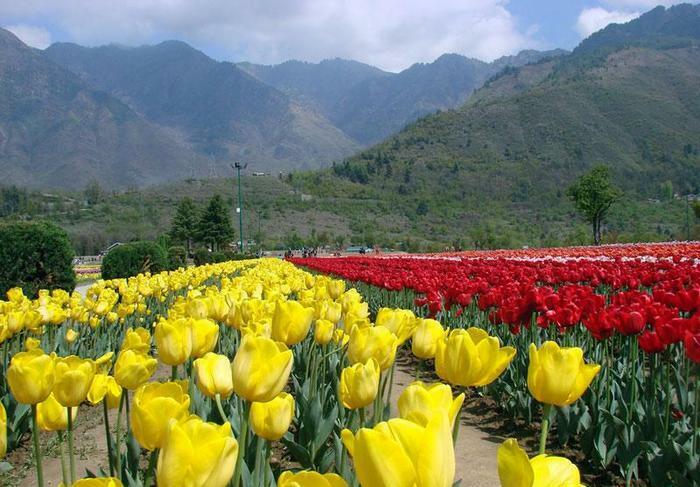 The magnificent hills, the breathtaking gardens, the amazing climate and the warm hospitality of the Kashmiris make this a wonderful holiday destination. It also lets your children learn and experience a part of their amazing country that they’ve only read and heard about. Witnessing the simple lifestyle of the Kashmiris, staying in a houseboat, skiing in Gulmarg, indulging in some golf at the beautiful greens, visiting the marvelous flower gardens and tickling your taste buds with some delicious Kashmiri food would only delight them and create memories worth cherishing for the rest of their lives. Popular places to visit here are Srinagar, Pahalgam, Gulmarg, Sonmarg etc. March to November would let you enjoy the beautiful gardens, refreshing climate, golf, river rafting and horse riding. But if you are a winter and snow lover, then you can enjoy skiing and snow boarding from December to February. By air – Srinagar has regular flights to and from other cities of the country into Kashmir. The three main airports for tourists to visit parts of Kashmir are the Jammu Airport in Jammu city, the Aerodome Airport in Srinagar and the Kushok Bakula Rimpochee Airport in Leh. By train – The Jammu-Tavi station is well connected to several major cities in the country. By bus – The State Road Transport Corporation buses connect various parts of Jammu and Kashmir to several cities of India. However, some parts are not very accessible and so jeeps or other vehicles can be hired to take you on further. Abhibus has several buses plying between Chandigarh, Shimla, Delhi to Jammu. This is another delightful state with a lot on offer for families looking for a great holiday, away from the city life. Misty and mesmerising green rolling hills, rejuvenating cool climate, enticing clear rivers, exciting flora and fauna, fruit orchards and thrilling adventure activities are what one can look forward to. 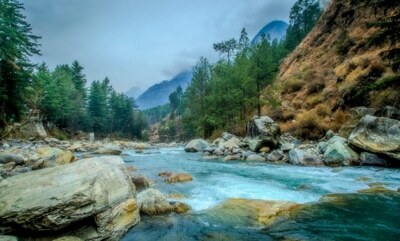 With the new generation of kids tackling stressful academic life and being hooked onto gadgets, with very little time to indulge in outdoor play, this destination provides them with that much needed avenue to just let go, be free, breathe in that fresh, pure air and try their skills at some interesting activities like white water rafting, trekking, paragliding, mountaineering etc. Some of the most visited places here are Shimla, Manali, Kufri, Bir-Billing, McLeodganj, Solang Valley etc. In Spring, which is April to June and during winter, which is from November to February. By air – Three domestic airports connect Himachal to the rest of the country. They are located at Kullu-Manali, Dharamshala and Shimla and have regular flights to Delhi and Chandigarh. By train – Given the rocky terrain in Himachal, train connectivity is not at its best. The main railway stations in Himachal are at Solan and Una. A toy train connects Himachal to Kalka. By bus – There is a good network of buses, both Private as well as State Road Transport Corporation buses, that connect Himachal to Delhi and other neighbouring states in India. Abhibus too offers bus services between Delhi, Chandigarh, Dehradun, etc. to various places in Himachal Pradesh. A visit to the national capital – Delhi is definitely a must-do with the complete family at least once. Home to several monuments, historical buildings and the centre of our current political set-up and government, there’s a lot of sights to enjoy, history to be soaked in and other exciting activities to experience. The Qutub Minar, Red Fort, India Gate, Jantar Mantar, Humayun’s Tomb and several other historical places let the kids relive a little bit of our rich past and history. Several beautiful parks across the city like the Lodhi Gardens, Nehru Park, Damdama Lake offer that much needed open space and green environment to just lie back and relax, enjoy small picnics and let the kids dash around and release their pent up energy. The Kingdom of Dreams at Gurugram is another fascinating place to let the kids experience and enjoy their childhood fantasies coming to life. And of course the adults can relive a little bit of your childhood in this wonderfully huge fairy tale set-up which put up amazing and larger than life shows. 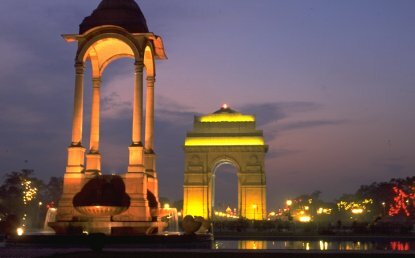 Besides all of this, Delhi is also known for its several delectable eating joints and bustling colourful markets. A visit to Delhi has to definitely include a trip to nearby Agra which showcases one of the seven wonders of the world – The Taj Mahal. This magnificent monument of love done in white marble with beautiful inlaid designs is definitely something to be proud of and cherish as a memory for a long time. Other interesting places that one can visit here are the Agra Fort, Fatehpur Sikri and Akbar’s Tomb. The ideal time to visit Delhi is from October to March, when the weather is wonderfully cool and invigorating. Delhi can be very hot and unbearable during summer. By air – The Indira Gandhi International Airport is well connected to several major cities across the country with regular flights to and fro. By train – Delhi has a very good rail network with several cities across the country. By bus – Regular buses ply between Delhi and some major cities of the country. AbhiBus has several buses plying from different cities of the state into Delhi. It also provides several bus options from Delhi to Agra. Almost always referred to as ‘God’s Own Country’, this destination is indeed blissful and has something to offer to every age group. 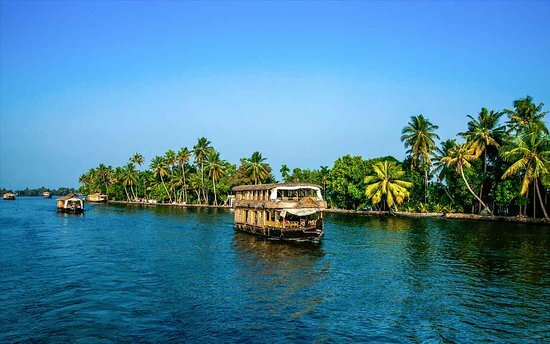 Whether, the wonderful scenic beaches, the lush green hills, the amazing wildlife, the calm and dreamy backwaters, spectacular waterfalls or some exciting adventure sports, one can plan a trip to this wonderland in such a manner so as to experience a little of everything. A trip to one of the several tea plantations, treks through the forested hill areas, a relaxing and leisurely ride in one of their houseboats or witnessing one of their frequently held boat races only add to the fun element. The added bonus of Ayurveda Therapeutic centres and Yoga and meditation centres only give you an opportunity to unwind and rejuvenate. The most frequented locations in Kerala are Munnar, Thekkady, Alleppy, Kumarakom and Wayanad amongst others. A trip to Kerala would be best after the monsoons, from September to March, when the climate cools down considerably. By air – Kerala has 3 international airports which has several flights coming in from several cities within India as well as internationally. They are the Thiruvananthapuram International Airport, Kochi International Airport and the Calicut International Airport. By train – Kerala has a very good rail network with several major cities across the country. By bus – There are State as well as several Private bus operators that offer services from several major cities into Kerala. AbhiBus too offers bus services from Bengaluru, Chennai, Hyderabad etc into Kerala. Another fun destination to holiday at with the family! 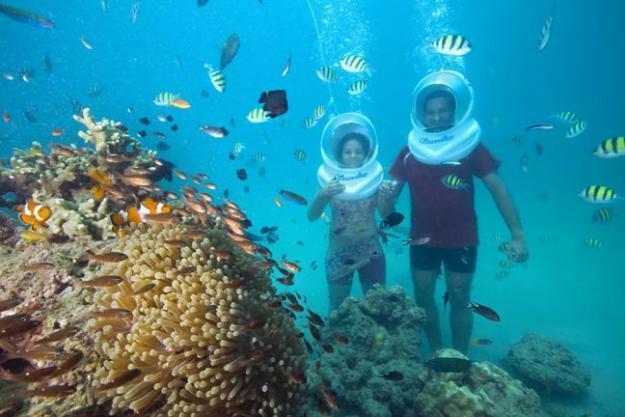 An exotic island with beautiful beaches, exciting underwater sports, rich flora and fauna and breathtaking landscape make the Andaman and Nicobar Islands an ideal place for the whole family. The clear blue waters and white sandy beaches entice both kids and adults alike to indulge in some exciting scuba diving and snorkeling. There are plenty of interesting sights and historical places to visit also, like the Cellular Jail National Memorial, Little Andaman lighthouse, the Samudrika Marine Museum, the Anthropological Museum, Limestone caves etc. October to April is a great time to visit this island. One can reach Andaman Islands only by air or ship. By air – The Veer Savarkar International Airport at Port Blair has direct flights coming in from Delhi, Mumbai, Chennai, Kolkata and Bengaluru daily. By ship – Ships leave from Chennai, Kolkata and Vizag 3-4 times every month. Located at an elevation of 2050 metres, Darjeeling in North East India is famous for its spellbinding natural beauty. This hill station offers breathtaking views of the Himalayas and more specifically the Kanchenjunga, which is the third highest mountain in the world. The weather is splendid all year through and hence families can make a trip here during summers to enjoy the amazing landscapes, the lush green tea plantations, the misty mountains, the beautiful botanical gardens, mystical monastries and so much more. The sunrise views at this destination make for an unforgettable memory. 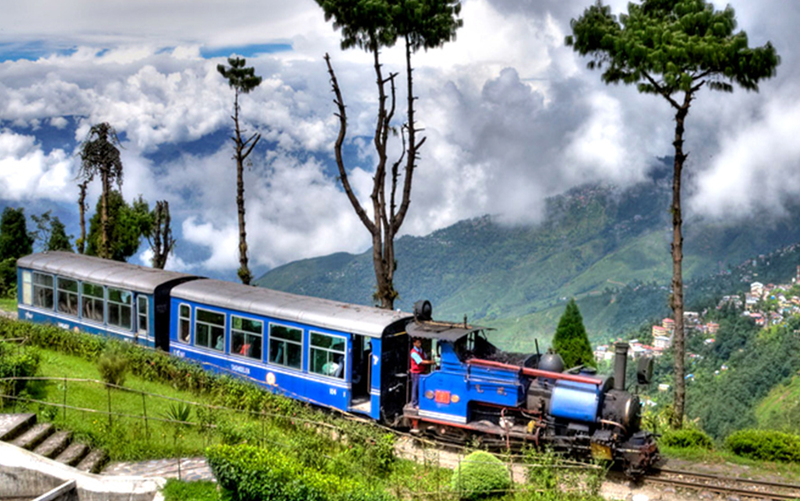 Another exciting experience for families with kids is the very popular toy train or mini-train service that Darjeeling offers from New Jalpaiguri to Darjeeling, which should be availed of. The cable car is another enjoyable attraction for kids. One can visit this destination right from October, after the monsoons, till June so as to be able to enjoy the magnificent outdoors. October to March would be quite cold and hence appropriate woollens would be required, especially for kids. By air – The Bagdogra Airport is the nearest airport which has regular flights coming in from Delhi, Kolkata and Guwahati. By train – The nearest railway station is at New Jalpaiguri which has a good rail network with several cities in the country. One can take the toy train from there to Darjeeling. By bus – There are regular bus services running from Siliguri, Kurseong, Kalimpong and Gangtok into Darjeeling.